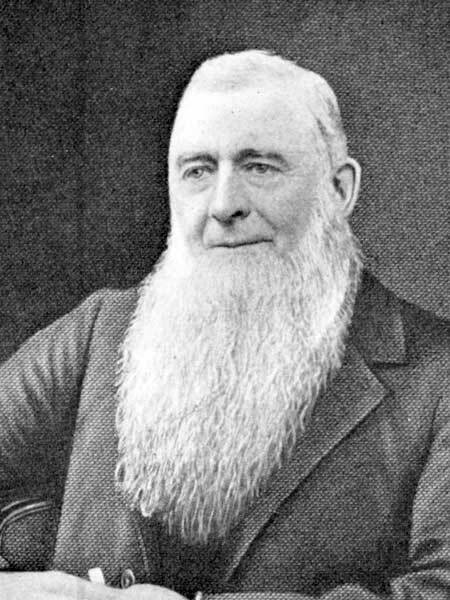 Born at Johnston, Scotland on 19 April 1842, he emigrated with his parents to Canada at the age of five months and settled at Bytown [now Ottawa, Ontario]. The family later moved to London, Ontario where Calder was educated. He worked in the coffee house business and as a butcher, then began his business career as superintendent of the first street railway in London, in 1873, with the London Omnibus Limited. In March 1874, he formed Calder & Company’s Stage Line in partnership with William Donnelly. The business was dissolved in the fall of 1874. In 1879 he moved to Winnipeg as the representative of George Jackson, a manufacturer of agricultural implements, and John Campbell, a carriage maker. Later that year he erected a warehouse on Main Street that became the Iroquois Hotel by the early 20th century. In 1880 he opened the first store on Portage Avenue, continuing it until 1883 when he became a ticket agent and labour employer for the Canadian Pacific Railway. He operated the railway and steamship ticket agency of Alexander Calder & Son on Main Street for many years. He was also one of the first purchasers of land at the future site of Brandon. In 1883 and 1884, he built a warehouse and the Grand View Hotel at Brandon. On 31 December 1863 he married Ann Rebecca “Annie” Williams (1841-1924) of Beachville, Ontario. They had six children: Fred A. Calder (1866-? ), Arthur B. Calder (1869-? ), Anna M. Calder (1870-? ), A. E. Calder (1875-? ), George Calder (1880-? ), and Ross Elma Calder (1882-?, wife of John J. Gardiner). The family lived at several Winnipeg locations, including 497 Broadway (circa 1911) and 33 Middle Gate (1915 to 1936). He served on the Winnipeg city council from 1892 to 1893. He was a member of the AF & AM (Ancient Landmark Lodge), St. Andrews Society, and Presbyterian Church. At the time of his death, he was considered the oldest Rotarian in the world. He was fond of taxidermy, exhibited specimens in London, Glasgow, and Paris, and won many medals and diplomas. He died at his Winnipeg home, 17 Cornish Avenue, on 2 August 1936. “Alex. Calder, city pioneer, dies aged 94,” Winnipeg Free Press, 3 August 1936, page 1. We thank John Calder and Courtney Fairweather for providing additional information used here.